Chiropractic care is a holistic approach to keeping your spine and nervous system healthy, allowing your body to communicate as effectively as possible. Dr. Davidson aims to remove barriers for proper movement in the body. By identifying misalignments in the spine, he is able to perform specific adjustments that encourage pain relief, increased movement, and more. Once your range of motion is restored, Adjusted For Life Chiropractic Health Centre believes you will be able to express life at a different, higher-quality level. 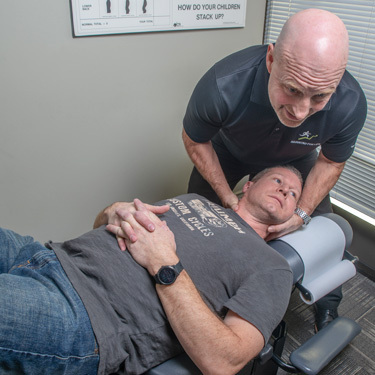 We offer a variety of adjustment techniques, including Full Spine Diversified Technique, Thompson Technique, and techniques involving the Impulse Adjusting Instrument and motion palpation, to better meet the individual needs of each patient. Each of these methods can be tailored to your comfort level and are delivered as gently as possible. The approach that is chosen for you will be carefully selected based on your history and current condition. Chiropractic care is designed for patients of all ages. Because it is gentle and effective in nature, most patients benefit no matter their age. In addition to improving neck and back pain, chiropractic care has also been known to aid in poor posture and movement, pelvic pain, hip and shoulder problems, headaches, sciatica, poor sleep, digestive issues, and anxiety. Your initial visit with us will help us get a better idea of how to best serve you. Our variety of adjustment techniques and knowledge of the human body allow us to choose a plan of care specific to your needs. Ready to learn more about how natural chiropractic care can help you? We’d love to invite you to book a visit to our practice. Get started today by contacting us for your first appointment. We look forward to welcoming you!